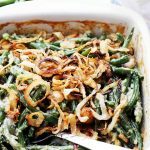 Lightened-Up Creamy Green Bean Casserole – A delicious and creamy lightened-up version of everyone’s favorite Thanksgiving green beans side dish made with fresh ingredients, and without the canned processed creams. A deliciously updated version of the classic Green Bean Casserole, with fresh green beans and mushrooms. We just had to keep the fried onion topping, which is arguably the best part, so we made our own Homemade French “Fried” Onion Rings! THOSE onions are crunchy AND homemade. AND baked. Hello Hellowwww! Wazzup! Can you BUHLIEVE that Thanksgiving is in like 2 weeks?! I am in complete denial that the Holidays are approaching, and you can just blame the weather conditions for my feelings because, today it’s 60 degrees out there. In fact, the day I made this gorgeous and so, so, SO delicious Creamy Green Bean Casserole, it was around 75 degrees. Not very Thanksgiving-ish, now is it? Unless you’re in Florida, then I guess it’s all good and understood. So let me tell you what happened here. Meatless Monday ➡ We want a Casserole ➡ I need seasonal veggies ➡ Can’t have cream. And, you know how heavy cream makes everything amazing and delicious, and things like that? Well, I thought out loud, “what IF I completely looked way beyond the heavy cream and reached for the Silk Soymilk, just to see what happens. Then, it would be like, no cream, no dairy, lactose-free, but creamy and delicious! ?” I actually said all of that out loud. To myself. At the grocery store. I figure, plant-based diets are good for us and better for the planet, and they taste amazing, too. 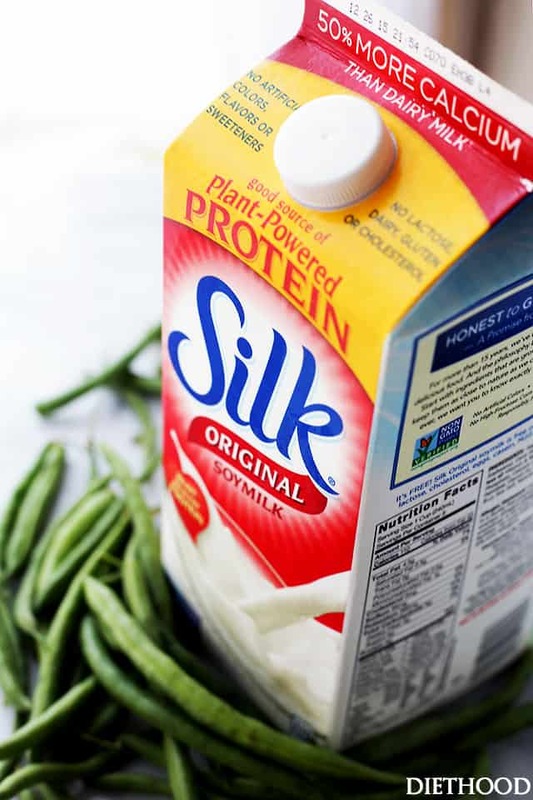 Silk’s plant-based alternatives are versatile in the kitchen and can be used to create delicious meat-free and dairy-free versions of many Fall favorites, including the good ol’ and traditional green bean casserole. And my Jalapeno Macaroni and Cheese Cups. Sooo, in line with all of that, I thought why not add some of that plant-goodness to our favorite side dish Fall recipe that will also be included in our Holiday menu! Dairy-free butter, dairy-free milk, no bacon, lots of onions, and green beans galore. Healthy casserole, indeed. And it’s vegetarian, it’s cholesterol-free, lactose-free, gluten-free (without the onion-topping), vegan … am I missing something? I think I’ve got you all covered. I think. I would also like to share one more important tidbit; be sure and taste the cream before adding it to the green beans. Again. Be sure to taste it taste it and taste it! And season it until you are satisfied with the taste. M’kay? Thanks. Also? Make the onions-topping. That’s, like, totally amazing. A delicious and creamy lightened-up version of everyone's favorite Thanksgiving green beans side dish made with fresh ingredients, and without the canned processed creams. Fill a saucepan with water and bring to a rapid boil. Add green beans to the boiling water and cook for 3 minutes, or until desired tenderness. DON'T overcook - they will be mushy if you do. Drain and rinse under cold water until beans are completely cooled. Drain thoroughly, place in a large mixing bowl, and set aside. In the meantime, melt 3 tablespoons butter in a large skillet. Add onions to the skillet and season with pinch of salt; cook over medium heat for 3 minutes, or until soft, stirring occasionally. Add the mushrooms, turn up the heat to medium-high and continue to cook for 4 minutes, stirring occasionally. 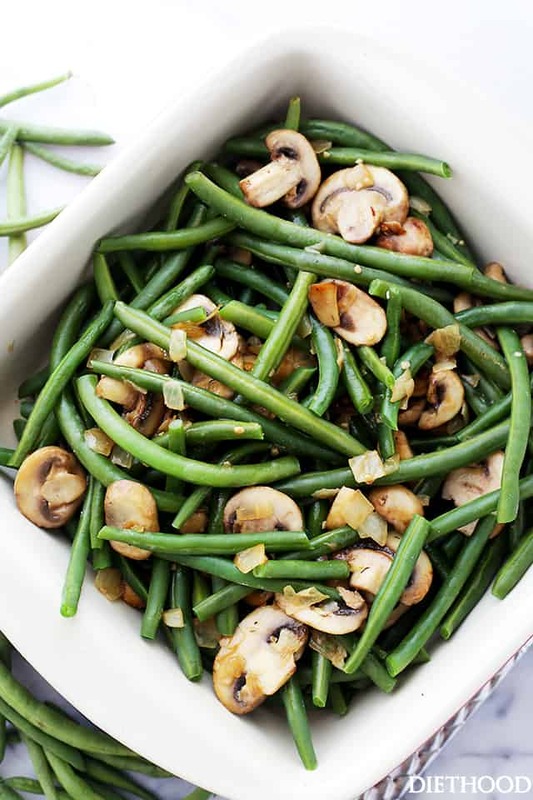 Remove from heat and transfer mushroom-mixture to a large mixing bowl with the green beans. Set aside. In the same skillet, melt 3 tablespoons butter over medium heat. Whisk in flour; continue to whisk for about 1 minute, or until flour mixture turns light brown. Slowly pour in the soymilk and continue to whisk and cook for 4 minutes, or until thickened. Season with salt, pepper, and nutmeg; remove from heat. Taste for seasoning and adjust accordingly. Let stand 5 minutes. Stir the sauce and pour it over the green beans and mushrooms; toss to combine and coat evenly. Transfer the green beans mixture to previously prepared casserole dish. Bake for 30 to 35 minutes, or until sauce bubbles. Give it a good stir before serving and top with Homemade French "Fried" Onion Rings. 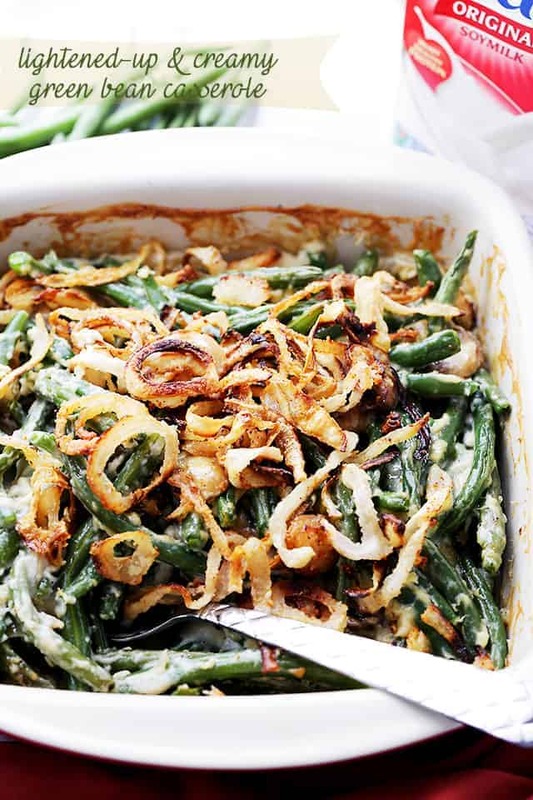 Green bean casserole is my favorite side dish, love that you lightened it up! Thanks for your green bean casserole lightened! Sounds divine and plan to use this Thanksgiving. I have a gluten sensitive daughter and family gatherings can be difficult for her. One concern in looking at your recipe is the all purpose flour…. I would substitute corn starch as a thickening ingredient. Then use caramelized onions on the top. Any other tip you may have? LOVE this recipe! 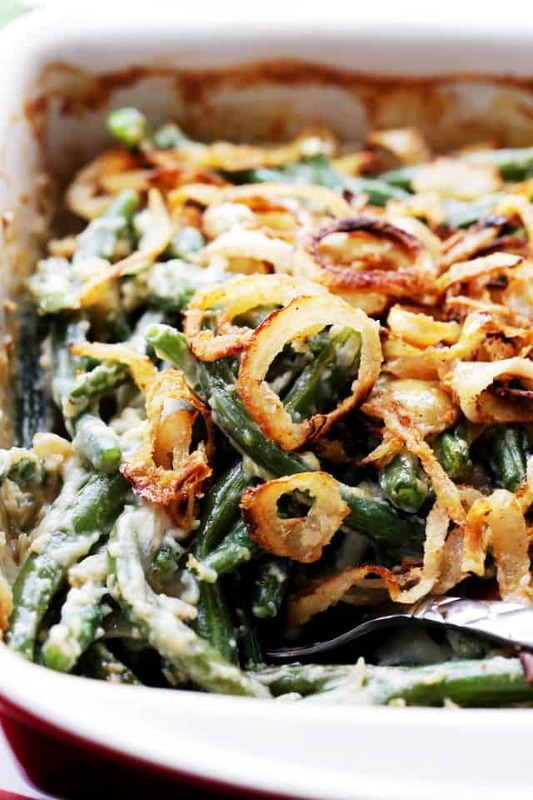 Green bean casserole is my favorite part (we don’t use the canned soup either). But the mushrooms and homemade crispy onions are amazing! Um, those onions? Talk about the perfect topping for this delicious looking casserole! This looks so good! 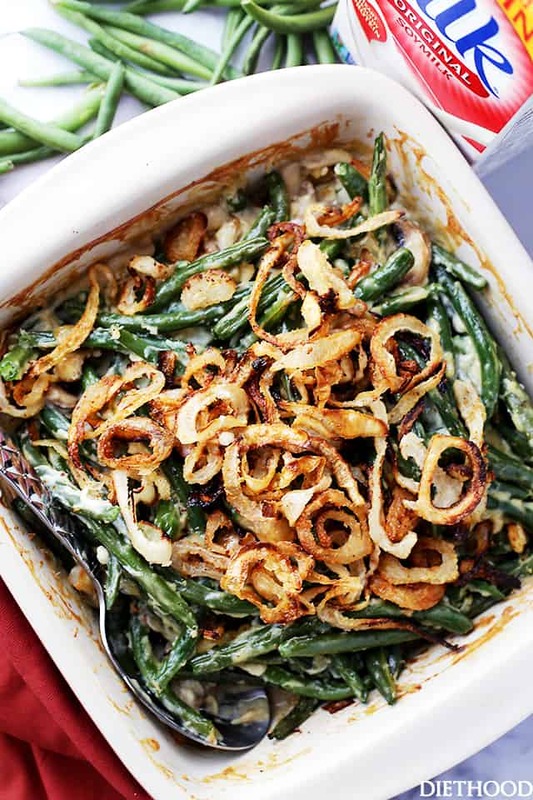 Green Bean Casserole at the holidays is a must. I love the fact that this is fresh and not from a can. …and those onions… total fist bump! Hahaha now after meeting you, I can totally vision you explaining your thought process… at the grocery store. Hilarious. And this casserole looks delish and I love that you substituted cream for Silk. Silk is pretty awesome in its versatility!